Last week marked the fifth anniversary of the U.S. Special Operations Forces (SOF) action that killed al Qaeda leader Osama bin Laden. The publicly acknowledged raid highlighted the prominent role special operations forces have played in the ongoing war against terror. More recently, U.S. SOF have served on the front lines in the fight against the Islamic State (ISIS). Raids conducted by SOF in Iraq have resulted in the killing or capture of several leading ISIS figures, including finance minister Abu Sayyaf, second in command Abd al-Rahman Muhammad Mustafa al-Qaduli, and chemical weapons chief, Sleiman Daoud al-Afari. Such efforts, however, do not come without costs as demonstrated by the deaths of U.S. Navy SEAL Chris Keating IV in Iraq last week and of U.S. Green Beret, Staff Sergeant Matthew McClintock, in Afghanistan in January. On April 25th, U.S. President Barack Obama ordered an additional 250 SOF troops to Syria to help in the battle against ISIS, bringing the total number of Special Operations Forces in Syria to approximately 300. This comes on the heels of Defense Secretary Ash Carter’s announcement of an additional 200 special operators sent to Iraq. These troops are part of a larger deployment of SOF across the Middle East and Africa. In October, President Obama ordered 300 SOF troops to Cameroon to work with West African soldiers fighting Boko Haram, a Nigerian terrorist group with ties to ISIS. Last week, India’s first conventional submarine in over a decade and a half — the INS Kalvari — finally began sea trials, amid reports of Indo-US cooperation in tracking Chinese submarine activity in the region. As sightings of Chinese submarines become more frequent in the Indian Ocean region, the Indian Navy is looking at innovative ways to gain an edge in anti-submarine warfare (ASW) capabilities. Can the Indian Navy effectively counter a modern Chinese submarine force, which is primarily optimized for regional anti-surface warfare missions near major sea lines of communication in the Indian Ocean? India’s expenditure on defence acquisition has remained largely static in real terms in recent years, resulting in constraints on not just the navy but the armed forces in general. The defence outlay for fiscal year 2016/17 was INR 2.49 trillion (USD 36.63 billion), but according to IHS Jane’s 360, this was counterbalanced by rising inflation, and weakening of the Indian rupee against the U.S. dollar over the past two years. Furthermore, the force posture and modernization agendas of the Indian armed forces under the continued broad influence of a “two-front war” construct have left the Indian Navy with a mere 16 percent of the defense budget (excluding defense pensions). This limits the navy’s capacity to address increasing diffusion of the People’s Liberation Army-Navy (PLAN)’s capabilities in the region. The five on-going state elections in India hint at a shift away from old established players who have failed to recognise the dreams of the youth. This is part of a global trend, from the Arab upheavals, to Hong Kong’s Umbrella protests, to Donald Trump and Bernie Sanders in the U.S.
Five major state elections are on-going in India. West Bengal and Assam in the east, and Kerala, Tamil Nadu and Puducherry in the south. These states are distinguished from their other counterparts in India by the presence of a strong regional culture that supercedes the national culture. They are dominated by regional political parties that supercede the presence of national political parties in their states. All are likely to see upheaval in their cozy existence – some more than others – come May 19 when election results are declared. This has implications for India as a country, and its foreign policy. The most interesting states by far are West Bengal and Tamil Nadu. Both are in the grip of two-party dominance for the last four decades or more. The single-party grip of the Left in Bengal has been loosened by the determination of Mamata Banerjee of the Trinamool Congress, so now instead of one party, Bengal has two, but the street level tactics are not so different. Tamil Nadu has been ruled, in turn, by the Dravidian parties of the DMK run by Karunanidhi and his family, and AIDMK run by Jayalalithaa and her bureaucrats and cronies. Pakistan is hesitant to take action against the Afghan Taliban on its soil because of concerns the group will re-direct its violence against Pakistan and Afghan intelligence will support it, a senior Pakistani official said. ​​As recently as the start of the current operation in North Waziristan in 2014, the Pakistani official said, the Afghan government issued refugee cards to militants who escaped to the other side. Nearly 15 years after 9/11, the war in Afghanistan is raging and Pakistandeserves much of the blame. 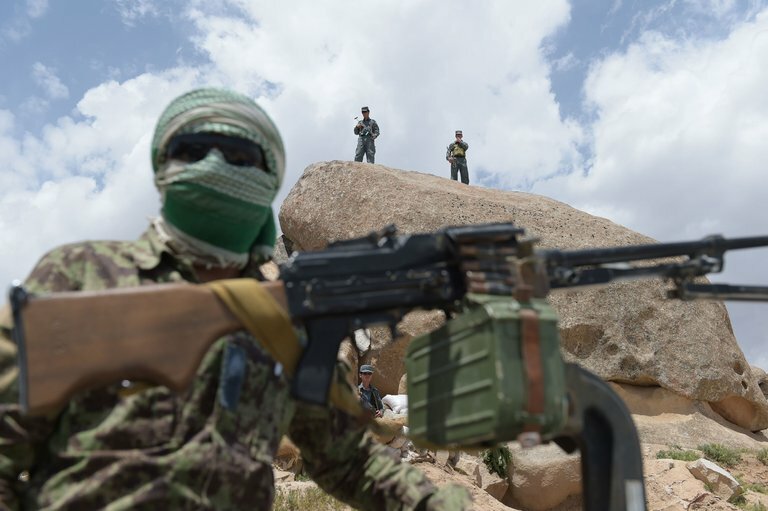 It remains a duplicitous and dangerous partner for the United States and Afghanistan, despite $33 billion in American aid and repeated attempts to reset relations on a more constructive course. In coming weeks, Gen. John Nicholson Jr., the new American commander in Afghanistan, will present his assessment of the war. It’s likely to be bleak and may question the wisdom of President Obama’s goal of cutting the American force of 10,000 troops to 5,500 by the end of the year. The truth is, regardless of troop levels, the only hope for long-term peace is negotiations with some factions of the Taliban. The key to that is Pakistan. Pakistan’s powerful army and intelligence services have for years given support to the Taliban and the Haqqani terrorist network and relied on them to protect Pakistani interests in Afghanistan and prevent India from increasing its influence there. Under American pressure, the Pakistan Army recently waged a military campaign against the Taliban in the ungoverned border region. But the Haqqanis still operate in relative safety in Pakistan. Some experts say the army has helped engineer the integration of the Haqqanis into the Taliban leadership. Saudi Arabians woke up over the weekend to a once-in-a-decade cabinet reshuffle. Octogenarian oil minister Ali al-Naimi, who has been in charge of the Kingdom’s energy policy since 1995, was replacedby Khaled al-Falih, who is to head the newly created Energy, Industry, and Natural Resources Ministry. Majed al-Qusaibi was named head of the newly created Commerce and Investment Ministry. Finally, Ahmed al-Kholifey was made governor of the Saudi Arabia’s Central Bank (SAMA). It may come as a surprise to many Saudis that the origin of this reshuffle—and indeed the Kingdom’s new economic direction—finds its impetus in a report by the global management consulting firm McKinsey & Company. Chinese officials took a rhetorical hard line this week calling U.S. military actions in the South China Sea the “greatest threat” to stability in the region and vowed to increase its own military presence in the region, according to a Wednesday statement from the Chinese military. “China will intensify sea and air patrol and enhance construction of defense capabilities in the area as needed, firmly safeguard national sovereignty and security and resolutely maintain peace and stability in the South China Sea,” read a Wednesday statement from the Ministry of National Defense. The statement follows a Tuesday U.S. freedom of navigation operation in which a U.S. destroyer sailed within 12 nautical miles of a Chinese controlled installation in the Spratly Island chain. USS William P. Lawrence (DDG-110) conducted an innocent passage past Fiery Cross Reef, a Chinese-controlled artificial island — also claimed by Taiwan, the Philippines and Vietnam, according to the Pentagon. Advances in Chinese missile technology are putting the big American base, formerly a sanctuary, in range of attacks. Long-range Chinese missiles are becoming an increasingly acute threat to U.S. military forces on Guam, the island anchor of the American strategic position in the Pacific, according to a new report. While the weapons probably don’t represent an immediate direct threat, continued advances in range and precision could put the still-expanding U.S. bases on Guam in China’s crosshairs in the event of a big conflict in Asia. The report, prepared by the U.S.-China Economic and Security Review Commission and released Tuesday, highlighted advances Beijing’s military has made in bolstering its ability to push U.S. forces farther away from Chinese shores. Those advances include new kinds of ballistic and cruise missiles, as well as ships, subs, and bombers that can launch them. The weapons in the Chinese quiver, according to the report, can easily reach Guam, the western-most U.S. territory and home to a naval base, an air base, and regionwide fuel and ammunition depots. “China’s commitment to continuing to modernize its strike capabilities indicates the risk will likely grow going forward,” the report noted. Defense experts stress that rapidly improving Chinese strike capabilities pose a particular risk to the Guam garrison, which has been steadily expanded in recent years to give the U.S. military a stand-off base in the Pacific that would be less vulnerable than bases on Okinawa. Explaining Chinese actions in the Woody Island in the Paracels, on February 17, 2016, Chinese Foreign Minister Wang Yi announced that the deployment of surface-to-air missile launchers as well as a radar system is a limited but necessary national defense facility for the exercise of its rights to self-defense under international law. The notion of self-defense arguably is highly subjective. Legal scholars contend that there is no precise guideline on the inherent right to self-defense in case of an armed attack under Article 51 of the UN Charter. Anticipatory self-defense as recognized in customary international law is the use of force even before an actual attack. It has a set of preconditions which include necessity and proportionality to the imminent threat, which can also be de- pendent on value judgment.1 A state arming itself could be in preparation for self-defense either in anticipation of or following an armed attack. In the current situation in the South China Sea, there are states that are defending their right to freedom of navigation on one hand, and China defending its claimed territories on the other hand. When there is a mutual perception of threat, a common interpretation of the rights under international law, particularly the United Nations Convention on the Law of the Sea (UNCLOS) is imperative. There is a due going on in Turkey’s southern province of Kilis. Since the beginning of the year, forces of the Islamic State in Iraq and the Levant (ISIL) have fired katyusha rockets into KilisThe Turkish Armed Forces (Türk Silahlı Kuvvetleri, TSK) have responded with artillery fire and airstrikes, reportedly killing at least 862 ISIL fighters this year. Still, rockets have landed in Kilis every day in May. According to a combination of data from Metin Gurcan and Aaron Stein, as of May 8, 21 people have been killed and at least 88 wounded on the Turkish side of the border this year. There is growing anger at the local and national government over the disruption to daily life. Simultaneously, ISIL released a statement that it will soon show the consequences for Turkish state actions in a video featuring a TSK soldier captured in July 2015. Both sides appear to be escalating their reactions, culminating on the night of May 8, with the Turkish military for the first time announcing it had conducted a ground incursion into Syria. According to the pro-government daily Yeni Şafak, 15 to 20 Turkish special forces units entered ISIL-controlled territory to target rocket launchers. The raid was followed by airstrikes from coalition forces and with the knowledge of the United States and Russia. “THE REVOLUTION WAS for nothing. We changed one family of thieves for many families of thieves. This country depends on tourism. Now there are no tourists.” Such is the harsh judgment of one stallholder on Avenue Habib Bourguiba in Tunis, scene of many protests during the 2011 revolution. 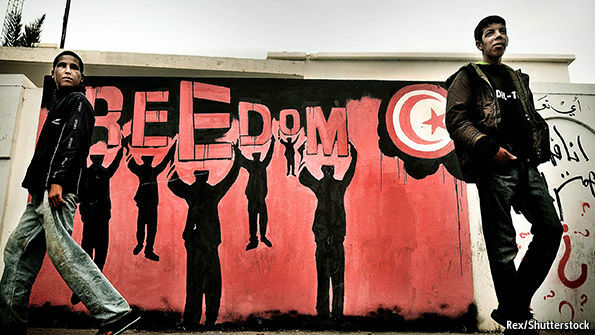 On the face of it, Tunisia has made an admirable transition to democracy. Its political parties have kept the consensus for pluralism, contested two rounds of elections and abided by the result. But the economy has languished, and protests are simmering once more in the deprived interior of the country. To an extent, Tunisia has been unlucky. It is feeling the instability next door in Libya: migrant workers have lost their jobs there, while the all-important tourism industry has been ruined by repeated terrorist attacks. An attempt in March by Islamic State to seize the town of Ben Guerdane, close to the Libyan border, rattled the country. But the coalition is fractious. It is struggling to enact economic reforms. And the ruling party, Nidaa Tounes, has split after little more than a year in power. In part this is because of the return of a bad old habit: President Beji Caid Essebsi seems to be trying to install his son, Hafedh, as his political heir. Still, Tunisia counts as success compared with the mess in other countries that cast off their leaders in 2011. For all the disappointment and sorrow in the years after the Arab uprisings, it is difficult to imagine the region reverting to the immobility of the decades before 2011. Authoritarianism is back, but many states are too weak and fragmented, and access to information too ubiquitous, for it to go unchallenged for long. Nearly a month after Defense Secretary Ash Carter announced plans to expand the U.S. military mission in Iraq, little additional combat power has reached the front lines outside Mosul where the Iraqi army has been slow to reclaim ground from well entrenched Islamic State militants. Those plans, announced in April, authorized the deployment of several American "enablers," including more than 200 additional troops and the addition of combat advisers within the Iraqi army's combat brigades and battalions. 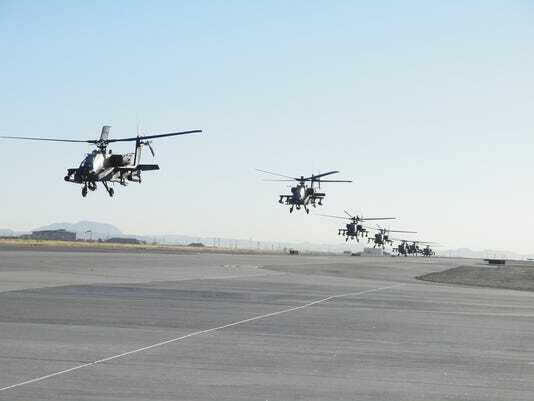 They also included an offer of U.S. attack helicopters to provide close air support for Iraqi ground forces. However, the number of U.S. troops in Iraq has declined slightly since then. American military advisers are not yet working at the brigade or battalion levels. And officials won't say whether any of the U.S. Army's AH-64 Apache helicopters in Iraq have been employed for combat operations. The additional combat power was intended to boost the Iraqi army’s push toward Mosul, the Islamic State's stronghold in Iraq. But the Iraqis' effort, launched in March, has advanced very slowly. So far, they've seized only a few small villages near their base in Makhmur. In late June 2013 the Economist underscored the need for stripping Iran of its nuclear program “to stem the rise of Persian power.” A “nuclear Iran,” it asserted, would seriously challenge Western interests in the Middle East and endanger “Israel’s right to exist.” The magazine concluded: “When Persian power is on the rise, it is not the time to back away from the Middle East.” Arguing from the opposite angle, Hillary Mann Leverett, a former U.S. National Security Council official, wrote in March 2015: “In reality, Iran’s rise is not only normal, it is actually essential to a more stable region,” because America’s recent “imperial overstretch” to permanently create a pro-American regional order, and the post-1979 Faustian bargain involving Israel and Saudi Arabia to contain Iranian power, had failed. President Obama has of late reckoned with this reality, after long denial by successive U.S. administrations since 1979. At the end of the second GCC-U.S. summit meeting in Saudi Arabia held on April 21–22, he delivered two important messages, among others, to the Gulf Arab leaders: that the United States had no interest in direct confrontation with Iran, and that the Gulf leaders should depend more on their military capacities to defend their countries. Implicit in Obama’s two messages was another significant message: the United States views Iran as a powerful actor in the Middle East, a reference to what he previously said in his interview with the Atlantic that the GCC should “share the neighborhood” with Iran, provoking sharp reactions from some of the Gulf allies. Turkish newspaper Cumhuriyet has long been subject to intense scrutiny from the government. For several years, the daily's journalists have been regularly threatened and arrested for criticizing Turkish President Recep Tayyip Erdogan and his ruling Justice and Development Party (AKP). But on May 6, a lone gunman opened fire on the newspaper's editor-in-chief, Can Dundar, as he addressed the press outside an Istanbul courthouse. During the attack, the shooter screamed that Dundar was a traitor, suggesting that the perpetrator is likely an ultranationalist. Although the AKP may not be directly responsible for the attack, by labeling Dundar and Cumhuriyet enemies of the Turkish state, it has effectively turned them into targets. In 2008, for instance, Cumhuriyet's offices were firebombed. The attack occurred while Dundar was on trial with another Cumhuriyet journalist, Erdem Gul, for an array of charges, including counts of espionage and revealing state secrets in certain Cumhuriyet reports. Dundar's wife interrupted the attack by pushing the gunman's arm, causing his shots to miss Dundar, though one diverted bullet grazed another journalist's leg. Muharrem Erkek, a deputy with the main opposition Republican People's Party, then grabbed and restrained the shooter until police could arrive at the scene. After the shooting incident, Dundar, who faced a potential life sentence for the charged offenses, returned to court, where he received a sentence of five years and 10 months in prison. One hundred years into the Sykes-Picot Agreement, a growing chorus of voices is asserting its imminent demise. Skeptics say that few of the Arab states’ borders ever made any sense, and the uprisings sweeping through Syria, Iraq, Libya, Yemen and elsewhere represent the long-overdue death rattle of the post-colonial order in the Middle East. Erasing states isn’t nearly as easy as it sounds, though, and proto-states that had only shallow rationales in 1916 have sunk deep roots in the century since. They cannot simply be swept away, and breaking them up will do little to promote the domestic harmony that they have failed to provide. When the dust settles, whenever that is, we are much more likely to see new kinds of states within the same borders that we see now in the Middle East than we are to see new states inside new borders. The Anglo-French pact to divide the post-Ottoman spoils into spheres of influence was never anything more than arbitrary, the argument goes, and the erasure of the Syrian-Iraqi border by the Islamic State group (ISG) in 2014 was a harbinger of the collapse of the whole system. It isn’t quite that simple. SANTA CLARA (Reuters) - Cyber attack techniques used by the U.S.-led coalition against Islamic State could also be used by other countries, U.S. Defense Secretary Ashton Carter said on Wednesday. Speaking in California, Carter told reporters that the U.S.-led coalition used electronic techniques to disrupt and degrade the jihadist force’s ability to organise and said an unspecified number of other countries could do the same in other conflicts. The remarks add more detail to a campaign that has only recently been acknowledged. The conference was also attended by the U.S. Secretaries of Homeland Security and Commerce. The cabinet secretaries had gathered for a day-long presidential security advisory board meeting that was the first to be held in Silicon Valley since the group’s inception more than 35 years ago. From former presidential candidates like Rubio to elder statesmen Burr and Corker, the latest line on Trump is he's "evolving." Understanding should precede action, yet a prime area of strategic weakness for the United States is its inability to understand the local social-political context of conflict and war. After failing to achieve any enduring strategic outcomes for this century, the Army returns to a state of suspended animation under the blissful blanket of combined arms maneuver. Rather than preserve human engagement capabilities that, dollar for dollar, do more to win the wars of today and the peace of the future, the Army is divesting itself of a large number of civil affairs forces. The 85th Civil Affairs Brigade is being deactivated. It is one of only two active duty civil affairs brigades, reducing nearly half of the force structure for the Army’s active duty civil affairs. Built from the battlefield demands of Iraq and Afghanistan, for example, the 85th Civil Affairs Brigade was created to aid the Army and Joint Force with unique civil-military operations — ranging from humanitarian assistance and disaster response to supporting major campaigns. Soldiers trained in foreign languages, culture, mediation, and negotiations, with an organic expeditionary medical component, provided crucial support to missions like Operation Unified Assistance to combat the Ebola virus outbreak in Liberia and Operation Inherent Resolve in Iraq, among others. Is Obama Going Soft on Taiwan? Did the Obama administration just signal president-elect Tsai Ing-wen to give some ground to Beijing on “the 1992 consensus” and “one China”? That may be the only plausible explanation of a curious moment that occurred during a Washington conference on Korea last week. After presentations and a series of interactions among the panelists and with the audience, Campbell seemed eager to elicit one last question. A woman obliged by asking about attitudes toward Korean unification among younger Americans and Japanese. WASHINGTON, — Since 2013, the Defense Advanced Research Projects Agency’s Plan X cyber warfare program engineers have done the foundational work they knew it would take to create for the first time a common operating picture for warriors in cyberspace. FBI Director James B. Comey said Wednesday that the bureau did not purposely avoid a government process for determining whether it should share with Apple the way it cracked a terrorist’s iPhone. In March, the FBI purchased a tool that exploited an Apple software flaw to hack into the phone of a shooter from the attack last year in San Bernardino, Calif. Many observers expected the bureau to submit the method to a relatively new government process for figuring out when to share software flaws with tech firms so they can be fixed. But the bureau told the White House last month that its understanding of how a third party hacked the phone was so limited that there was no point in undertaking a government review. Comey said Wednesday that the bureau purchased only the tool, not the rights to the software flaw. The FBI, he said, was focused on getting into the phone. “We did not in any form or fashion structure the transaction . . . with an eye toward avoiding” the government review, he said. How did we do it? Several hundred Afghans across the country reported on conversations they overheard during the course of their normal day. We instructed our Afghan network to report on passively gathered information, explaining that we had no interest in individuals’ identities. With CSOC’s large network, talented statisticians and analysts refined the data into atmospheric intelligence. For the first time, we had a meaningful measure of how Afghans felt about Afghanistan. Can Power Alone Explain American Interventionism? A Sense of Power: The Roots of America’s Global Role. John A. Thompson, 2015. The story of the United States’ ascendance to the pinnacle of global power has been told many times before, by authors ranging from foreign policy royalty such as George Kennan, to respected commentators such as Walter Lippmann and William Appleman Williams, and more recent efforts by scholars such as Walter Russell Mead, Christopher Layne and Stephen Sestanovich. Still, this familiar narrative finds new shine under the careful polishing of John A. Thompson, an emeritus reader in American history at the University of Cambridge. The question of why the United States would choose to use its prodigious economic and military power to backstop costly foreign military interventions is clearly timely, amid growing concerns regarding instability in the Middle East and the potential threat a “rising” China might pose. And yet Thompson laudably exercises great restraint by cleverly restricting his scope to American foreign policy from the end of the Civil War through the presidential administration of Harry S. Truman. In doing so, he is able to present a balanced view of the United States’ international growth without clumsily trying to extract policy-relevant lessons for modern politicians and decisionmakers. Indeed, the lack of such a lecturing tone is what makes Thompson’s historical exercise even more important, since it allows the reader to consider the historical evidence being presented without the polluting overlay of an explicitly contemporary lens. Any conclusions about the importance of past events on current times are therefore the full responsibility of the reader, rather than the spoon-fed byproduct of the author’s ideological commitments. A revanchist Russia and vulnerable Baltic states are on the minds of America’s defense establishment. After Secretary of Defense Ash Carter’s trip to Europe to oversee the change of command at European Command (EUCOM), it’s become clear according to senior defense officials that the plan is to transition the role of the command from “reassurance to deterrence.” U.S. military presence is returning in force to Europe in search of that old familiar conventional deterrence in the face of Russian aggression. From the $3.4 billion European Reassurance Initiative, of which $1 billion would go towards adding an Armored Brigade Combat Team in Europe (for a total of three U.S. brigades) to NATO’s recently announced plan to deploy 4,000 additional troops to Poland and the Baltic states, there is a clear policy shift toward territorial defense in Europe. Yet EUCOM’s new commander General Curtis Scaparrotti faces a daunting task, because deterrence is a difficult mistress to court. How do you know when you have it? Lost it? Gaining or losing it? When it comes to protecting NATO’s eastern flank, it could be a case of defending the indefensible. Have we thought about the different conflict scenarios for the Baltics or merely those scenarios that proponents of more forces in the Baltics would prefer to deter? Given the policy momentum, infusion of funding, and additional manpower for EUCOM, it is also time to ask some inconvenient questions about whether we truly understand what a conflict with Russia would look like in the Baltics and if conventional deterrence by denial is possible on NATO’s eastern flank. On May 25th, 1950, the “P3” — the United States, the United Kingdom, and France — issued a Joint Declaration on the Arab States and Israel. In this so-called Tripartite Declaration, the three countries declared “their unalterable opposition to the use of force or threat of force between any of the states” in the Middle East, as well as their determination to “immediately take action, both within and outside the United Nations, to prevent such violation.” Beyond this political commitment, made in response to the Arab-Israeli war of 1948, the declaration also endeavored to better coordinate arms sales to Israel and Arab states. This led to the establishment of a Near East Arms Coordinating Committee (NEACC) in which representatives from the three western powers compared notes on Middle Eastern arms requests. It became rapidly apparent that the declaration was unable to reassure Israel, which at the time insisted that Washington agree to a formal treaty-bound security guarantee, or Egypt, which rejected any form of Western-led security architecture. What’s more, the declaration could not overcome divisions within the P3 itself, whose members viewed it more as a vehicle to advance their national and often competing interests than as a genuine attempt to buttress regional stability. The NEACC became irrelevant after the 1955 Soviet-sponsored Egyptian-Czechoslovak arms deal and 1954 French arms sales to Israel. Ultimately, the discord created by the Franco-British initiative during the 1956 Suez war rendered the declaration a dead letter. The demise of P3 unity during the conflict and the failure of the Franco-British initiative itself left the United States as the main external security provider in the region for the first time. Indeed, while France and the United Kingdom did not retreat from the region, they would only play a secondary role in the U.S. strategy of containment of the Soviet Union in the Middle East.